Heat oven to 400°F. In large bowl, stir the flour, 1/2 cup granulated sugar, baking powder and salt until blended. Cut in butter, using pastry blender or fork, until mixture looks like coarse crumbs. In small bowl, beat eggs and 2 cups whipping cream just until blended. 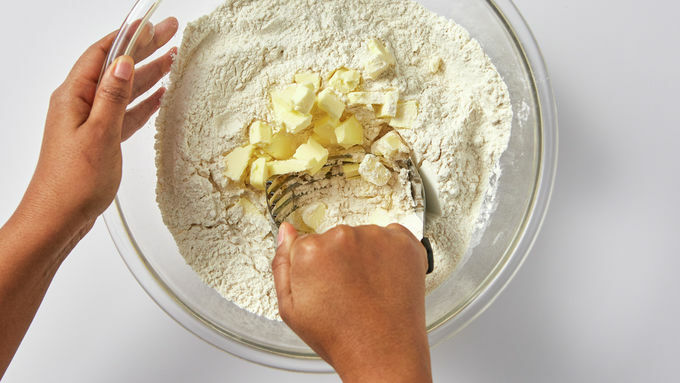 Stir into flour mixture until mixture forms a soft dough. 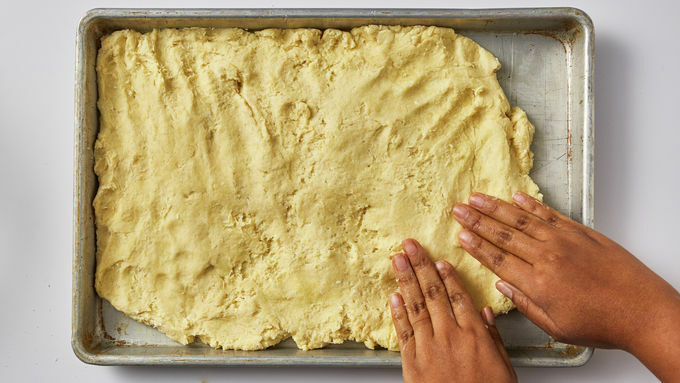 Using lightly floured fingers, pat and press dough in bottom of 15x10x1-inch ungreased pan. Bake 16 to 20 minutes or until golden brown. Cool completely, about 1 hour. Meanwhile, in large bowl, mix strawberries and 1/4 cup granulated sugar; stir occasionally. When ready to serve, in chilled large bowl, beat Topping ingredients with electric mixer on medium-high speed until stiff peaks form. Spread top with whipped cream. Using slotted spoon, spoon sugared berries over top. Cut into 4 rows by 4 rows. Store covered in refrigerator. 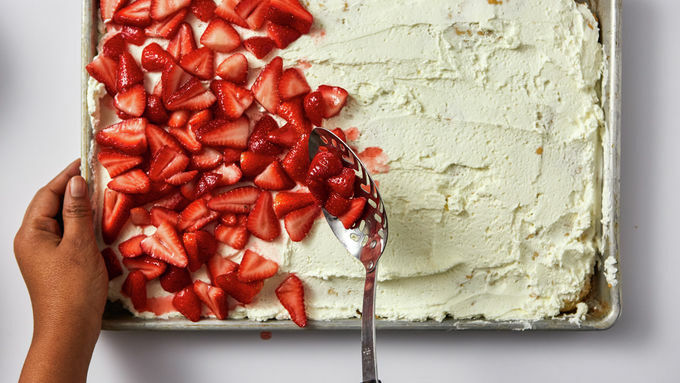 If serving later in the day, prepare strawberries 1 hour before assembling shortcake. Top shortcake with sugared berries right before serving so juiciness is controlled. Part of what makes strawberry shortcake so delicious is the treatment of the strawberries. A classic strawberry shortcake is made with macerated strawberries. Macerating is a way of infusing flavor into a food, often a fruit, usually by soaking in a liquid (often alcohol). In this case, strawberries are washed, hulled and sliced before being tossed with sugar, which draws out juice from the berries, so they literally stew in their own juices, which elevates their flavor and gives the juice a syrupy consistency. This means that even if your strawberries aren’t the juiciest, ripest berries of the season, they’ll taste even better and more like themselves after having been macerated. The one trick to macerating is keeping an eye on the clock. If you let them macerate for too long, they’ll turn to mush—delicious mush, but mush all the same—so take this step no more than an hour before serving your strawberry shortcake. If you like, try adding balsamic vinegar or Grand Marnier to your strawberries for extra depth of flavor. Besides macerated strawberries, the other thing that makes strawberry shortcake is the fresh whipped cream. To make yours perfectly, chill a bowl and beaters in the freezer or refrigerator for 10 to 20 minutes. In a chilled medium bowl, beat the whipping cream, sugar and vanilla on low speed of electric mixer until mixture begins to thicken. Gradually increase speed to high and beat just until stiff peaks form. Do not overbeat or mixture will curdle. 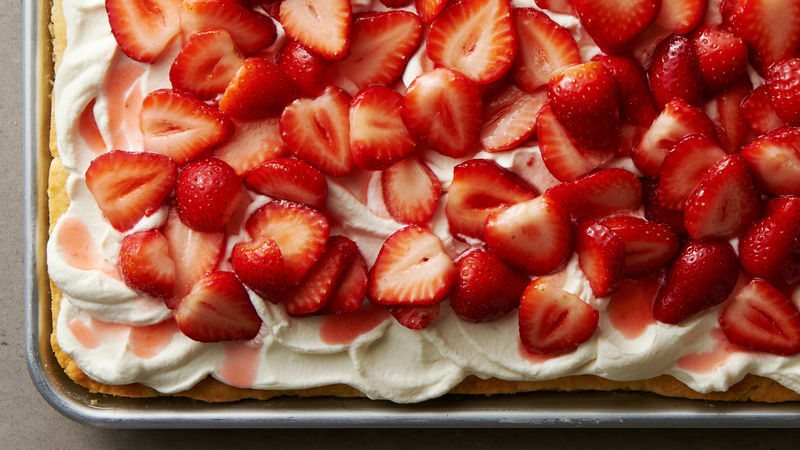 Try your favorite berry combination to top the shortcake. Need a smaller-size strawberry shortcake? Betty’s got plenty more strawberry shortcake recipes where this one came from! Check out our from-scratch Strawberry Shortcake, shortcut Classic Strawberry Shortcake (made impossibly easy with Bisquick!) or Pat-in-the-Pan Strawberry Shortcake. We’ve also got fun twists, like party-perfect Strawberry Shortcake Lush and Strawberry Shortcake Poke Bundt Cake.